This was a very slow week...only 3 lessons to review. I got a start on my gift knitting. Our photo shoot is next week and usually at this time I am frantically trying to finish things up but I've made a real effort the last few issues to get things to the office sooner so they can do styling. This gives me more time for personal knitting. I've noticed that the number of lessons I receive to review really goes down starting in November. I think everyone is gearing up for the holidays. Wouldn't your family member prefer swatches demonstrating increases instead of a hat? I guess not. Since Cast On is now digital I have made more references to videos demonstrating techniques. For the garments I have in the Spring issue, I mention in the patterns that they can find videos for certain techniques so I guess I better to those videos. This week will be how to work a tubular cast on which I use for the top down raglan striped dress. A word about the name...I am using "tubular" which is what we call this in the Masters Program. This technique has quite a few names. Some refer to it as "invisible" which it is but this term is also used for provisional cast ons. As far as I know "tubular" is only used for this technique. The edge is rounded. This is what the final product looks like. You may want to take a look at my blog entry for September 19th of this year where the tip was about provisional cast ons if you haven't used a crochet chain. I have a photo of where to pick up the loops. For the tubular cast on, you work a chain of half of the number of total stitches plus one. I generally make far more chains than I need as I am too lazy to do the math! 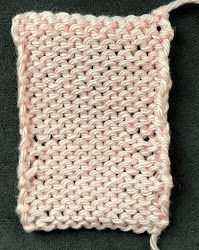 The difference between the tubular and provisional technique is that you pick up one stitch for each crochet bump for the provisional and for the tubular you make a yarn over between each stitch you pick up. In the photograph below you can see the stitch/yarn over pairs. When you are working this flat, you will have an uneven number of stitches as you need a selvedge stitch at the end. If you are working this technique in the round, you can have a yarnover at the end of the round. The next step is to work several rows where you work one stitch and slip the next. You need to work a minimum of two rows. The more rows you work, the more rounded the cast on edge becomes. If you are working flat, you knit the knit stitches and slip the purl stitches on all rows. If you are working in the round, you need to alternate this each round. You knit the knit stitches the first round and slip the purl stitches and on the next round you slip the knit stitches and purl the purl stitches. After 2-4 rows, work in K1P1 ribbing. Notice that the stitches are overlarge. When you use this technique work the tubular cast on with smaller needles that the size for the rest of the ribbing. The final step is to remove the crochet chain. Be sure you start at the end, not the beginning. This photograph shows the crochet chain partially removed. Salon will be on Sunday from 1-4 pm. I am going to a football game on Saturday. There is still quite a bit of yarn available if you missed out last week. Some posted a question about the salon....It is just a get-together I host at my house on either Saturday or Sunday every week for friends. There is absolutely no formal agenda or instructional component. If you are in Lexington KY over a weekend, send me an email and I will send you my address. For obvious reasons I don't post personal information in this blog. It is always fun to have someone drop by. I had a special request for fingerless mitts in lime green (Seattle Seahawks color). I generally do mitts with sock yarn but since the only yarn I had was a worsted weight I decided to keep them simple. I couldn't resist adding the L and R, which I outlined in another Seahawk color. Last week I wrote up a pattern which we will give to new members of TKGA. Mitts seem to be what people are requesting this year. I used the pattern I just did to test it out. Here are two I have finished for birthday gifts.